Super Eagles coach Stephen Keshi has intimated a confidence boost on his team preparing for the 2014 Fifa World Cup in Brazil. The 52-year-old expressed satisfaction about the team spirit in the senior national side, adding he is beginning to witness patches of the atmosphere which surrounded the 1994 squad- adjudged best Nigerian team in as many generations- in his current crop. 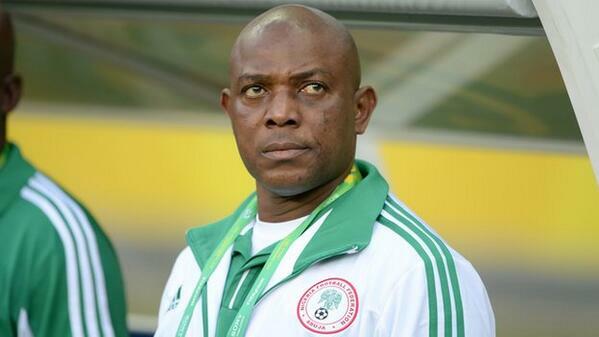 “I am beginning to see a good sign; everything is beginning to fall in place,” Keshi told reporters in Lagos on Monday. Stephen Keshi Gets Confidence Boost on Super Eagles. The Nigerian coach dubbed ‘big boss’ captained the 1994 set of Eagles in their debut appearance on the biggest stage in world football, in the wake of winning a second African Cup of Nations (Afcon) title for the West African country in Tunisia. They impressed with wins against Bulgaria and Greece, before losing narrowly to perennial World Cup opponents, Argentina, on their way to claiming leadership of their group. Nigeria reached the second round in their first World Cup appearance but were knocked out of the competition with two minutes left to sealing a quarter-finals appearance. Keshi attributed the 94′ Green Eagles success to teamwork and hopes such will be the story of the Brazil World Cup-bound team. The coach however could not specifically comment on the fitness level of his squad, but dismissed several injury reports concerning some of the players in his 30-man party for this summer tournament. “I know mentally they are ready, but I need to see them again on the field because we have not seen them since we played against Mexico. My goal is to bring joy to Nigerians and to do that we need to work harder,” added Keshi, who claimed he had spoken at length with the players and had checked on them to ascertain their fitness level. Boxing: Pacquaio Dominates Rios in Macao as Talks of Mayweather Bout Intensifies. Two Good Heads: McClaren Joins Redknapp at QPR; Samba Returns to Anzhi. Eagles Will Prove Themselves at African Championship- Obaobona. Next articleHave You Met Daniel Amokachi’s Wife And Twins?? ?